Report is from a couple of days ago. We went to Botany in search of kings, unfortunately the majority of Sydney's boating population seems to have the same idea at the moment. Firstly, we tried to find a few livies as our "bait" must have been refrozen between two to four times, some of the pillies were closer in consistency to mashed potates than fish. They were only supposed to be used as berley but we forgot to pick up some fresh bait and clearly over-estimated our bait gathering abilities as nothing was interested in the sabiki. Having given up on that endeavour, we motored over to the carpark that is Mollineux Pt. We waited patiently with our indicators on for someone to finish up and took their spot once they'd loaded their shopping in the boot. There were plenty of people with rods bent and we saw a few rat kings netted but we didn't get a touch ourselves. I don't really enjoy fishing in the crowds and as last week we managed to find a few fish by moving well away, we attempted to do the same this time which paid off. I was casting soft plastics at whatever structure we came across on our way back to the ramp and under a channel marker we found a school of kings. The first two dusted me off (they shouldn't have but I was playing them way too easy and my drag was too loose). Lessons learnt and leader upgraded from 20 to 40lb I netted the next one which was thankfully just legal with a younger brother following shortly after that was returned to grow. That made it five hookups in six casts, one of the hookups being the channel marker itself. Still getting to grips with the new combo (Samaki 4-8kg Zing, Stradic 4000) but at least it was blooded on its first outing. I used three different plastics (z man shad, z man minnow, sluggo) and all three went down the hatch. Guess they'll eat whatever if they're in the mood. Drifted very quickly around Towra for flatties for no success but did have another rat kingy following my prawn imitation SP in 2m of water. So they certainly are everywhere in the bay at the moment. Hopefully they add another 10-15cm or so and stick around. If you count channel makers as hookups, then you'd also have to count trees, oysters and the like. That means I am now classed as a master fisher. Thanks for the report mate, if I see boats I keep moving too, nothing worse than fishing in a car park, and as u mentioned kings can be anywhere in the bay, each to there own. I'll be having a crack Monday morn after this heat and crowds settles down. We'll be right wind dropping off tomoro and Monday, if u see a little white fibreglass runabout with a black mercury on the back flicking around come over and say hi. Yeh, its looking good atm. Will do, I plan to be on the water by 7am till around 11am, getting the last 2 hours before the high & 2 hours of the runout. 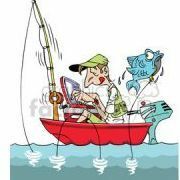 Going to start by doing some trolling then chase some flathead.